Sometimes networking just seems to either stop working, or stop working reliably on PCs and no matter how many times you restart the PC or disconnect and reconnect to the network nothing seems to get it working again. Networking can become flaky due to a setting, configuration option, or a file containing network connection details becoming corrupt. The good news is that there’s a quick fix for many networking problems, to reset the TCP/IP stack in Windows. TCP/IP is the protocol that governs how your PC communicates with other computers and devices on your network, and how it communicates with the Internet and the wider world. To reset the TCP/IP stack on your PC open a Command Prompt (Admin) window, by searching for the Command Prompt in the Start Menu, right clicking on it, and selecting Run as Administrator. 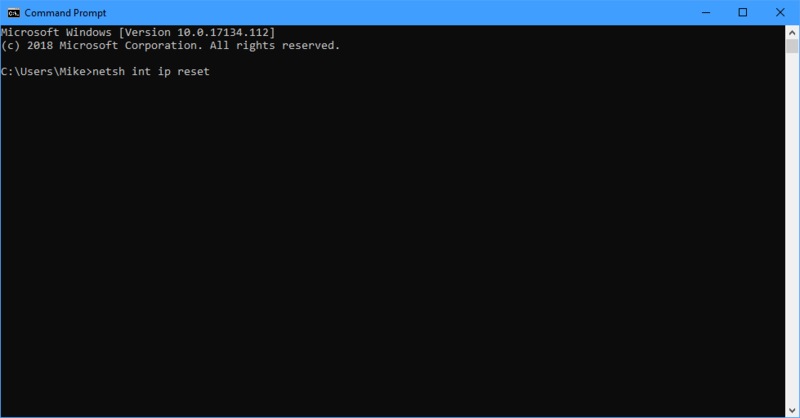 With the Command Prompt window open, type the command netsh int ip reset and press Enter. This is a simple, quick fix that will reset the TCP/IP stack to its default configuration. With this done, restart the PC and hopefully your network connection will begin working reliably again.